Is it possible to accurately perceive the world around us? Are engineers any more or less rational than the general public? Chris and Jeff discuss these issues with Jeff Ellis on this episode of The Engineering Commons. It’s challenging to accurately perceive reality from within the confines of the human mind. One approach to overcoming such limitations is called critical thinking. 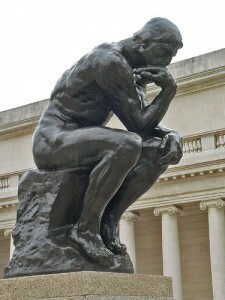 Our guest for this episode is Jeff Ellis, who writes about critical thinking on his website, The Thinker Blog. Critical thinking has been defined by Tim Van Gelder as “the art of being right.” This means adjusting one’s opinion willingly to the most defensible and rational viewpoint. Jeff Ellis is an aerospace engineer who currently works at NASA’s Johnson Space Center. He became interested in critical thinking as a means for avoiding and mitigating project failures. Overestimating one’s own abilities is a common cause for turning away valuable advice and information. The principle of reciprocity states that we should respect the reasonableness and the goodwill of those with whom we disagree. Critical thinking requires that we attempt to overcome the limitations of our human nature. We have emotional attachments to our opinions, which makes it difficult for us to shift our viewpoint. Common human biases include the confirmation bias and hindsight bias, as well as political biases. There are many cognitive biases that are part of the human condition. We still don’t know if some brains are pre-wired for engineering, or if engineering education develops what we recognize as stereotypical engineering attitudes. Chris really likes the blog post titled Critical Thinking for Engineers. Young engineers tend to transition too quickly from problem definition to solution generation, since creating things is the “fun” part of engineering. Along a similar vein, young engineers can become too enamored with their first solution. Some people take advice about critical thinking well, while others are offended that their opinion is being challenged. Jeff Ellis wishes critical thinking skills were taught in college, as opposed to being left for workplace training. He also feels that the nation’s top liberal arts schools produce excellent critical thinkers. Real world complexity means that there is rarely a single clear “textbook” answer. Thus, rational evaluation is needed. Dealing with “alpha-geeks” can be a challenge, as Jeff Ellis outlined in his post, Castles and Tents. Being able to handle disagreement in a congenial manner is an important skill when working in a team environment. Civility is an important component of critical thinking. Jeff Ellis has the handle @twiticalthinker on Twitter, and an email address of jeffellis1 ..at.. gmail.com.